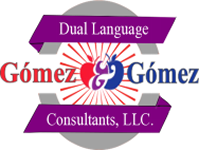 The Gómez and Gómez DLE Model, as any other instructional model, depends on a high level of Fidelity of Implementation. To this end, districts implementing our model should seek additional training to the basic 2-Day Initial training in order to achieve a high level of academic and linguistic effectiveness. We strive to provide you with high quality Teacher and/or Administrator training to meet this school or district need. Districts wishing to host one of our “Regional Trainings,” allowing participants from other districts to attend, will receive a 20% discount off the normal training fees to help offset beverage and snack costs for all participants. Please contact Dr. Richard Gómez Jr at 956-455-3198 if you would like to host a “Regional Training”. Trainer: Dr. Richard Gómez, Jr.
*This is the original 3-Day Training condensed into a 2-day training in Texas. Note: This training is open to all staff from Regular Education classrooms in schools and districts using the Gómez & Gómez DLE Model. Training focuses on the "best practices" used in this DLE Model. This training is designed specifically for "regular" program teachers, whose language of instruction is all in English, to benefit from the research-based 28 Best Teaching/Learning Practices imbedded within the Gomez and Gomez Dual Language Enrichment model. ELL Teachers who are not yet implementing Dual Language, can also find this training helpful by utilizing these best practices even before the Dual Language program rolls up into their grade level. THIS IS A BRAND NEW TRAINING!!! This training will create a regular dual language school day, but rather than children students, the training participants will become the students! Teachers/Administrators will be taught middle school lessons in Math, Science, Social Studies, and Language Arts according to the Dual Language Lesson Plan Cycle! Teachers will experience actual DL Best Practices from the student point of view. This will give teachers invaluable and authentic insight returning to their classrooms confidently and read to implement their district's DL model effectively! Support students in the BICS stage of second language acquisition. This highly rated two-day training is virtually all “Make and Take” of BLC activities under the guidance of our Consultant (a MA in ). Teachers walk out of the training with high quality (academic and linguistic) BLC activities in hand that they can utilize the very next school day. In this one-day training, participants will learn the deeper facets of Bilingual Research Centers in regards to their intent and purposes. As part of the training, participants will actually construct several BRCs, so bring your laptops! 2018-2019 Training Dates to Be Announced! Please Visit Us Again Soon! This Administrator Training will introduce the academic and linguistic strengths of our ELL model to Education Administrators of all levels. Administrators will learn of the tie between research, instructional best practices, and other strategies that serve as the underpinnings of our highly successful G&G Model. This training is especially geared towards Superintendents, Associate Superintendents, C&I Directors, Coordinators, Principals, and other district administration members. This is an intensive and powerful training that brings all of the "G&G 28 Best Practices" into the lesson plans for each academic subject. This training will "connect the dots" for teachers to see the strong correlation between the 28 best practices imbedded within the model and ELL success on a daily basis. The result of effectively implementing the skills learned in this training will be a significant increase in rigor, writing across the curriculum, paired learning, a student-centered classroom and much more. Dr. Richard Gómez Jr. will personally conduct this training. This 2-Day training addresses the most asked about G&G component, our SLAR and ELAR (two language arts) 2nd – 5th grades. Consistency in ELL classrooms is extremely important for program effectiveness. Teachers will receive a step-by-step guidance through an entire 6-weeks of intentional and targeted Language Arts instruction. Teachers will be guided in “unpacking” the TEKS, attaining a more profound understanding of their language arts lessons. Teachers will also create a 6-weeks curriculum map and then utilize their maps to create their own lessons for two additional weeks! Participants will leave the training with a total of 8 weeks of ELL lessons! Day 1: Introduction of Language Arts Curriculum Guide 6-weeks template as well as overall explanation of the most critical factors in developing rigorous and purposeful lessons aligned to the G&G Model. Teachers will also create a 6-week curriculum map for their respective grade level. Day 2: With guidance from the G&G Consultant, participants will utilize their 6-week curriculum guides created the previous day to curriculum write 2 weeks of lessons for their respective grade level. Day1: Introduction of Math/Sci/SS Curriculum Guide 6-weeks template for PK-1st Grades as well as overall explanation of the most critical factors in developing rigorous and purposeful lessons for ELLs. Teachers will also create a curriculum map for the semester for their respective grade level. Day 2: With guidance from the G&G Consultant, participants will utilize their curriculum map created the previous day to curriculum write two weeks of lessons for their respective grade level. Participants will learn how to embed research-based writing strategies and "Best Practices" into teachers' instruction. The focus will be on learning strategies to promote writing across the curriculum, maximizing writing opportunities presented by activities such as paired learning, language of the day journals, and efforts to raise academic and linguistic rigor for all students. Day one: Analysis of the process of sheltered instruction and the key role it plays in developing strong academic content and language development in Secondary DLE and NON-DLE classrooms. Day two: It can be done! Strategies will be addressed along with other methodology for successful content and academic language development in the Secondary DLE and Non-DLE classroom. Our highly experienced Consultant can schedule any number of days as requested, either consecutively or spread out over the school year. This Mentorship opportunity is excellent for virtually all Administrators but especially for Administrators that are new to ELL Programs or new to DL programs. Building “Capacity” in these areas will be significantly accelerated as a result of this mentorship opportunity. Parental involvement is key to the success of a Dual Language Enrichment program. This parent institute is arranged into four different components that are designed to give parents an understanding of targeted second language acquisition concepts and how they fit into the program model. Parents will walk away with a tool box of ideas to support their child’s learning at home. “¡A escribir se ha dicho!” Enjoying literacy at home. Numbers are everywhere! Connecting math with everyday life. 2018-2019 Trainings to Be Announced! Please Visit Us Again! Our DLE experts will completely redesign and “make over” a teacher’s DL Classroom to incorporate all of the G & G DLE Environment components! See some of the before and after pictures on our website www.gomezandgomez.com. The classroom teacher assists our consultant who takes this opportunity to explain the rationale and the “why” to each component, and in that way, this serves as an excellent “one on one” training as well. Our consultants can complete two DLE Class Make-Overs in one day. The DLE Environmentally-Complete classrooms will serve as class models for other teachers as well. Our highly experienced (30 year Master teacher) and effective Consultant will shadow your DLE teacher for as long as you deem necessary. Throughout the experience, our Consultant will shadow the teacher, guiding, explaining, providing suggestions, demonstrating lessons, literally providing your teacher with whatever she/he needs to become a much more effective DLE teacher. Pair up our Consultant with a teacher for two hours, a half-day, or for entire day(s). This training does what you don't have time to do, but you know is needed! Please contact Dr. Richard Gómez, Jr. at 956-455-3198 for your specific training needs.